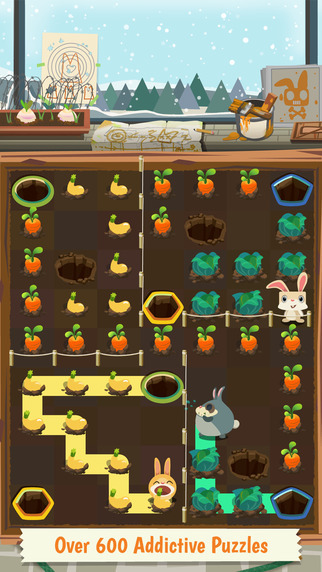 The Best iphone, ipad Puzzle Apps and Mechanical Puzzles: Patchmania - A Puzzle About Bunny Revenge! 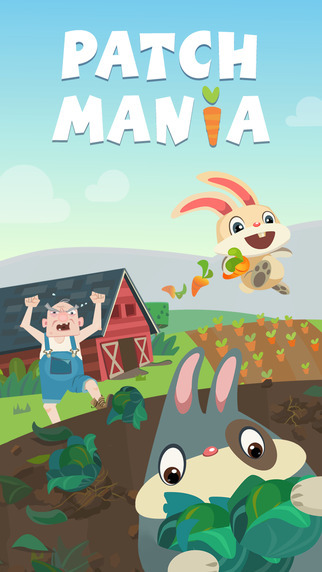 Glen Iba recently contacted me about his company's new puzzle app game Patchmania - A Puzzle About Bunny Revenge! It's a topology puzzle game. The object is to make sure that each critter eats his/her preferred vegetable and then jump back into a safe hole before the farmer comes. are located in San Francisco. There are over 600 levels. Many of them are quite simple. So you can jump right in. At the bottom of this section are some of the other topology games I've played over the years. I particularly like this genre & have solved thousands of these. Of the 600 levels in Patchmania, I've solved around 375. I plan to complete all of them. What's new: having multiple paths/critters. Calvin only eats carrots, while Otto eats just cabbage. Daisy eats the pink stuff. Peanut eats the squash. Essentially it seems that many levels have multiple puzzles within them. However, mushrooms can be eaten by anybody and when they're mixed in, things get tricky. Also, because there are multiple holes, it's sometimes tricky to figure out where the starting point and ending point is. Very Impressive: over 350,000 people have downloaded this, as evidenced by the leaderboard. Fun: the graphics are quite cute. When you haven't made a move in a while, Calvin, starts to juggle. When Daisy jumps into the hole, she pirouettes. Otto starts to snooze if he's waiting too long. There is a 'Terms of Service' page for users. I'm guessing it's in jest. But I'm not sure. By the way, I reviewed Glenn Iba's old game Monorail almost 4 years ago! Update 3/31:According to Glen, the Patchopolis levels are downright devilishly hard. I haven't gotten to them. I've slowed down my pace....they're getting tougher. Equalise: puzzle app game for iphone, ipad. Free!